Ruoteng Xiao of China competes on the rings during the men's individual all-around final of the Artistic Gymnastics World Championships, at Olympic Stadium in Montreal, Canada, on October 5, 2017. MONTREAL - Xiao Ruoteng led a Chinese one-two in the men's all-around at the World Artistic Gymnastics Championships, filling the vacuum left by the injury withdrawal of Japan's Kohei Uchimura. Xiao, who was not on China's team at the Rio Olympics last year, totalled 86.933 points, overtaking Russian David Belyavskiy on the final rotation for the gold. Belyavskiy had seized the lead from Xiao on the penultimate rotation with a superb performance on the parallel bars. But the Russian fell on his final routine, on the horizontal bar, and dropped to fourth place -- just off the podium as he was in Rio last year. Lin Chaopan grabbed silver with 86.448 points and Japan's Kenzo Shirai earned bronze with 86.431. Shirai opened with a strong floor exercise in his bid to keep the men's all-around title in Japanese hands. But he slipped back on the rings, unable to follow in the illustrious footsteps of Uchimura -- who won every Olympic and world title from 2009 through 2016 but hobbled out of the competition on Monday with a left ankle injury suffered in qualifying. Oleg Verniaiev was favored to come away with gold in Uchimura's absence. The Ukrainian came within a whisker of beating the Japanese star at the 2016 Rio Olympics but endured a disastrous night in Montreal. A fall on the pommel horse, his second apparatus, dropped him to 19th. He had worked his way up to sixth before falling on his final horizontal bar routine to finish eighth. The championships continue on Friday with the women's all-around final, with apparatus finals for men and women on Saturday and Sunday. Uchimura isn't the only marquee name missing. Romanian Larisa Iordache, a favorite for the women's all-around title in the absence of reigning champion Simone Biles of the United States, made a tearful exit on Wednesday after tearing an Achilles tendon while warming up for the floor exercise. 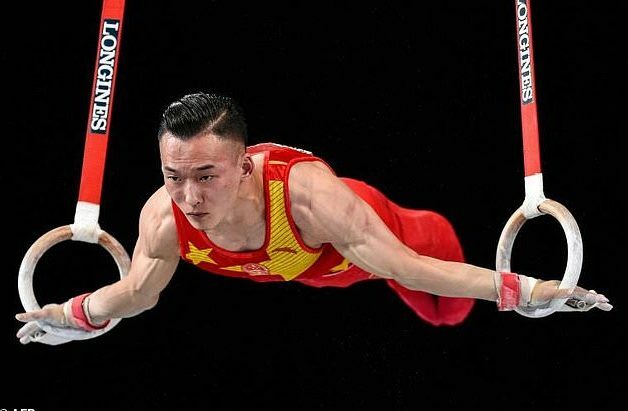 Xiao Ruoteng led a Chinese one-two in the men's all-around at the World Artistic Gymnastics Championships, filling the vacuum left by the injury withdrawal of Japan's Kohei Uchimura.